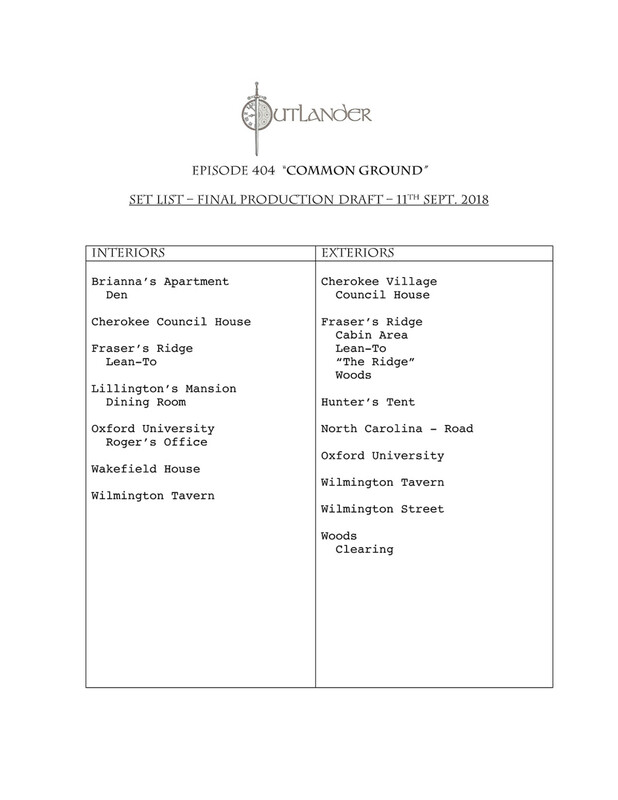 “Common Ground” was chosen as the title because the theme of the episode is for Jamie to find common ground with their new Cherokee neighbors who live near Fraser’s Ridge. 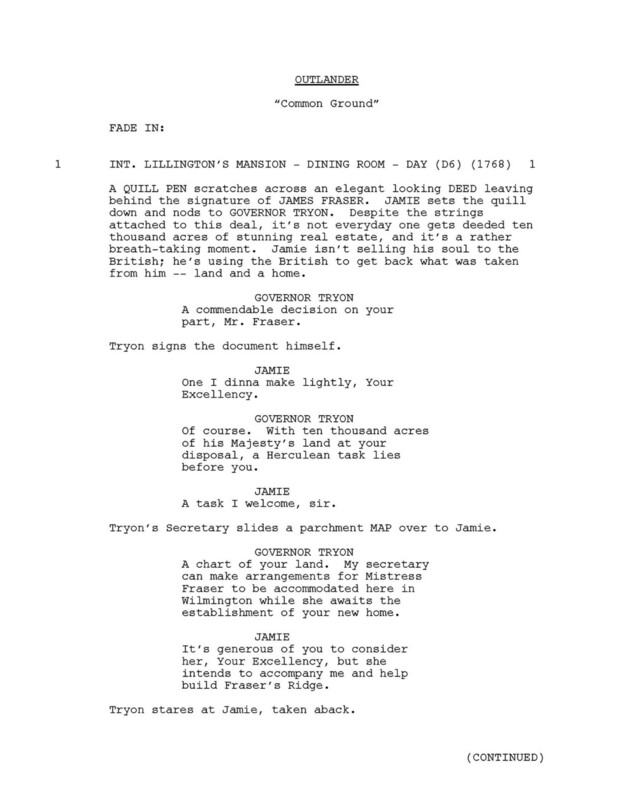 This scene is not in the book, but since we always refer to this transaction as Jamie “making a deal with the devil,” we thought that it’d be cool to see the actual signing of the papers with said devil. 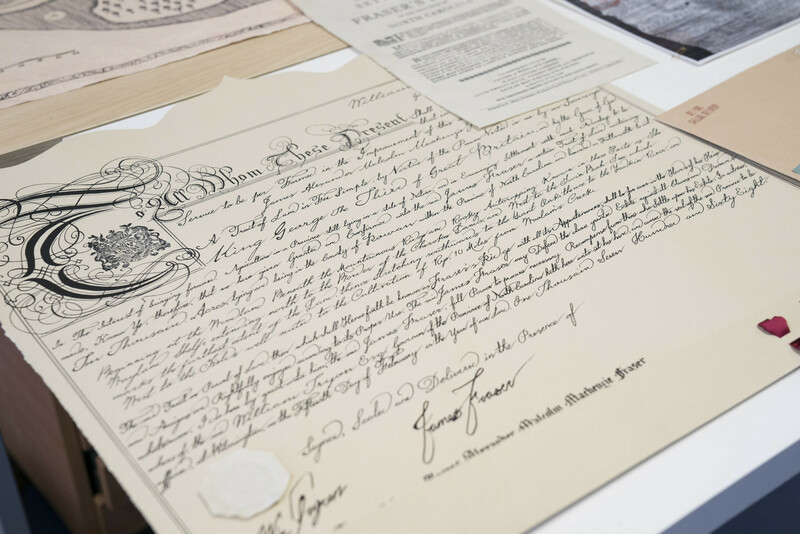 As Jamie takes ownership of the land, we’re reminded that the price of his new home is to be available to do Governor Tryon’s bidding should Jamie be needed to fight the Regulators. 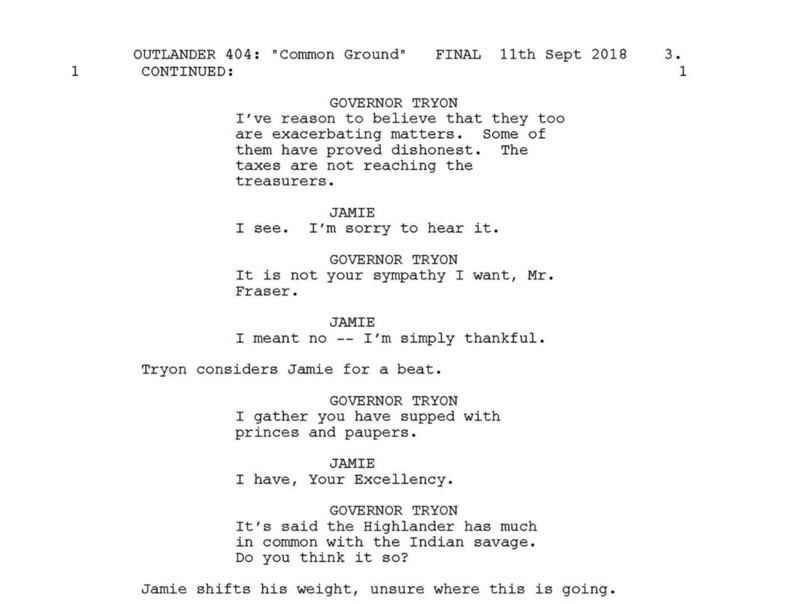 Jamie’s line here, “There is the law and there is what is done,” is a callback to what Tryon told him at the dinner party when the governor first dangled the offer of land in return for Jamie’s loyalty. We thought it’d be nice for Marsali to express that she misses her mother. 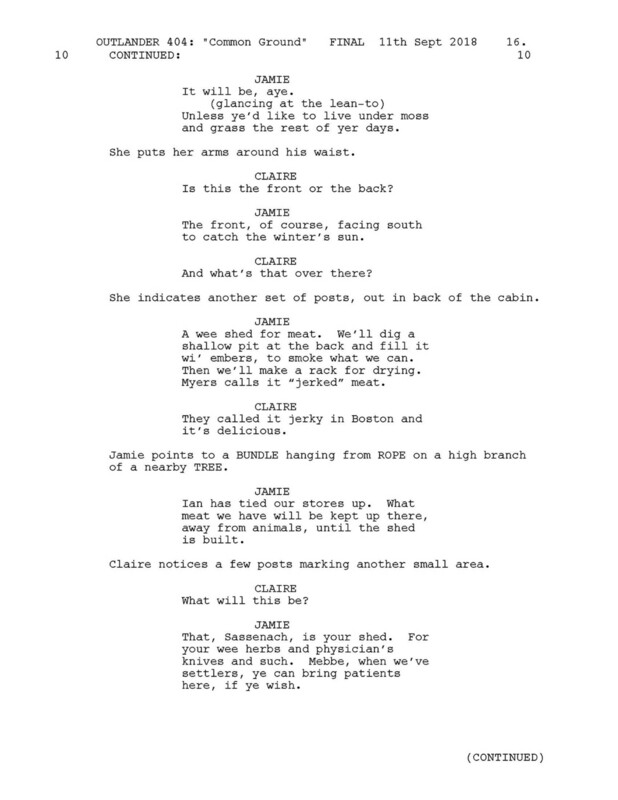 It was a fun scene to write, as the challenge was navigating Claire’s feelings about Laoghaire. 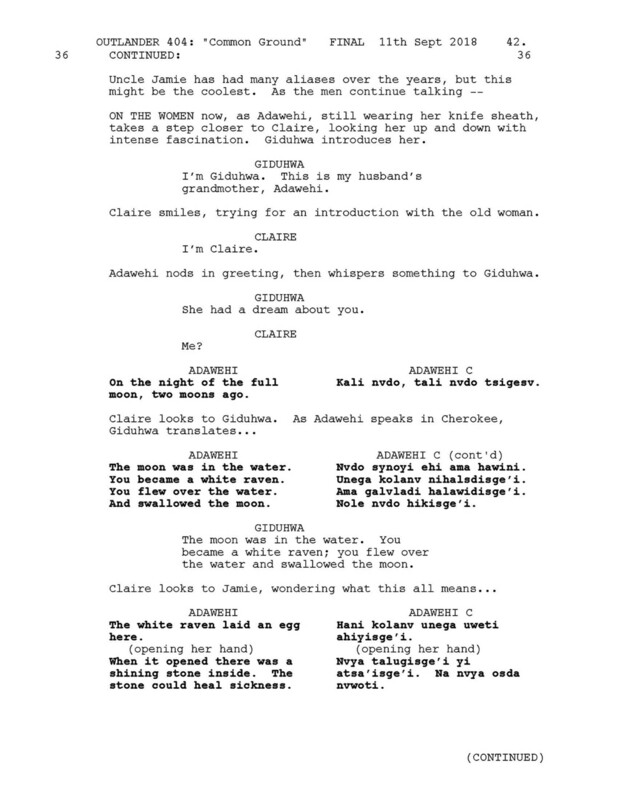 Even though Claire is no fan of Marsali’s mom, Claire is missing her own daughter and can empathize with a pregnant Marsali missing her mother. 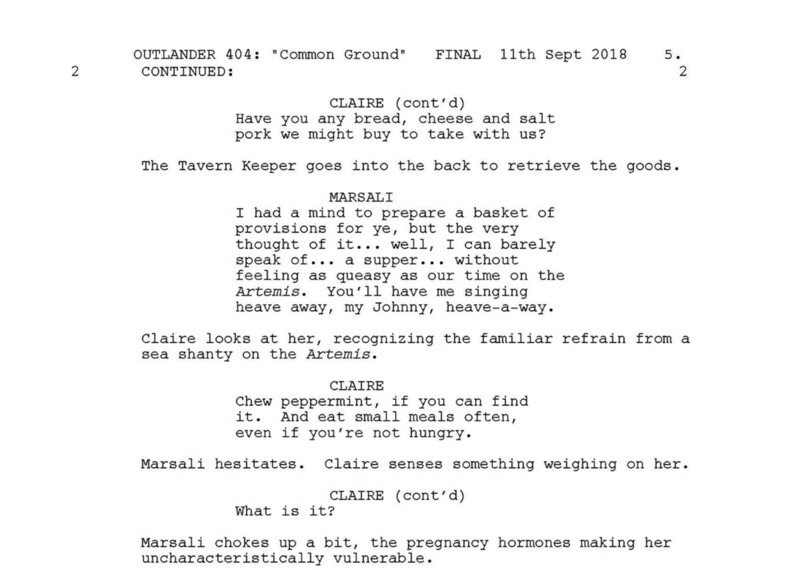 Claire’s kindness towards Marsali in this moment shows the warm, maternal side of Claire and bonds the two women further, since their rocky start. 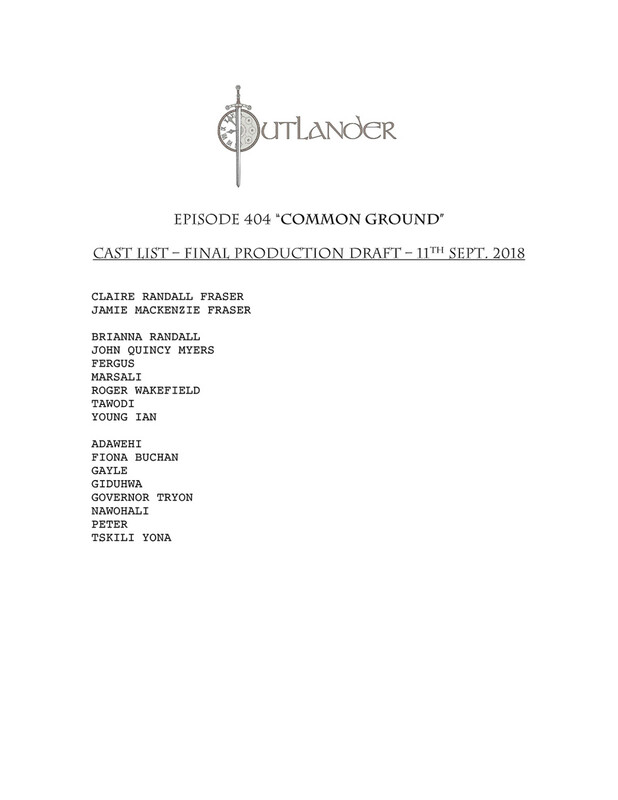 Jamie senses the emotion rising in Claire and surmises that she’s missing Brianna and reassures her that their daughter must be missing them as well. Claire and Jamie’s arrival at “The Ridge.” This time, they take in the beautiful view knowing that the land now belongs to them. We wanted to portray the joy they felt at their arrival of what is to be their new home. 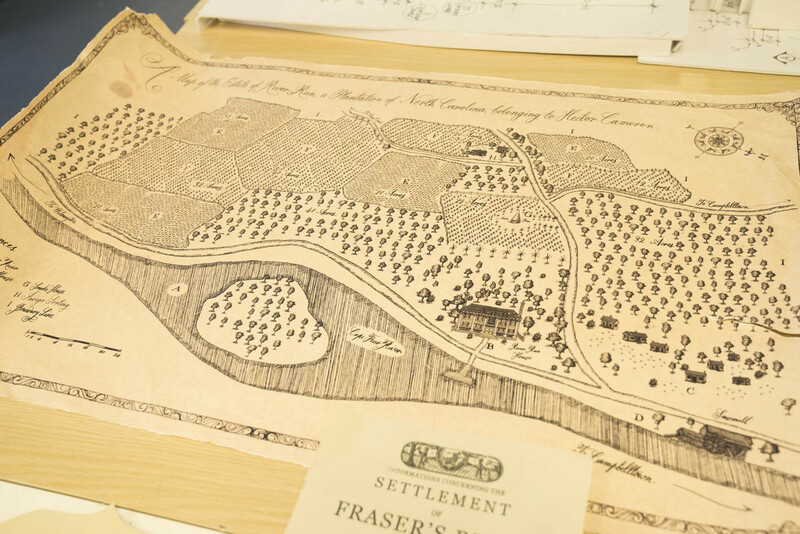 We thought it would be cool to show how settlers used to stake out their property to denote boundaries on their land, and how it was dependent on landmarks such as the uniquely shaped “witness trees.” The location department did a great job finding cool examples of witness trees in Scotland. 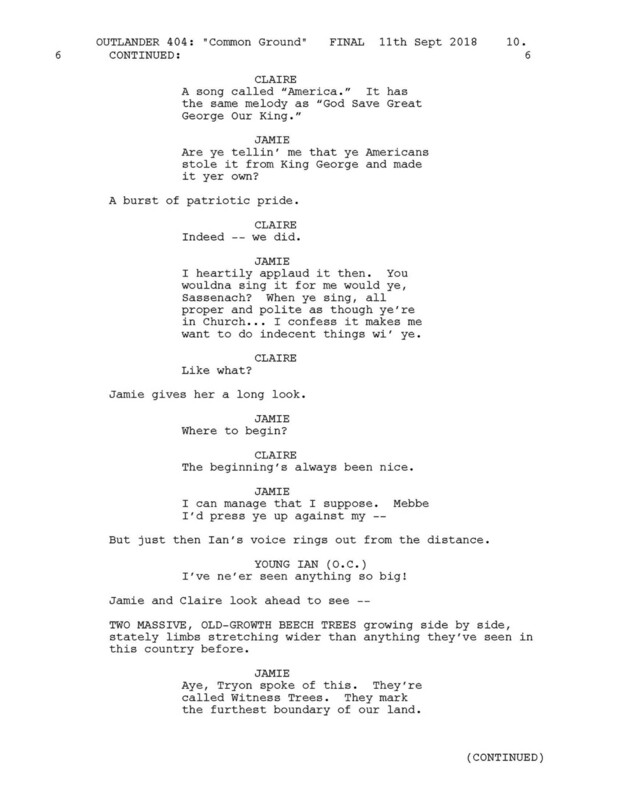 Another fun fact—our research showed that the patriotic song “America” has the same melody as “God Save the King.” We thought it would be fun to have Claire and Jamie joke about how the Americans stole it from the English. 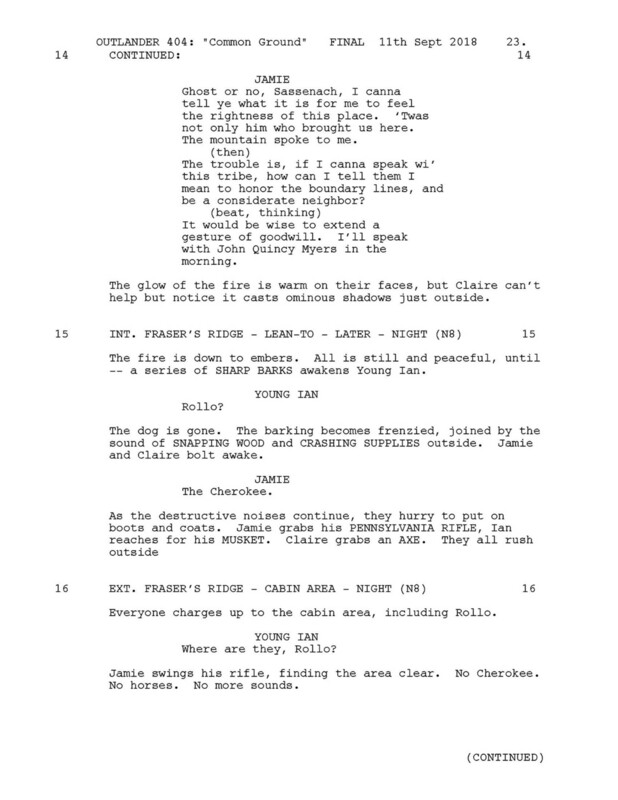 Claire and Jamie’s interaction with Cherokee warriors is the first sighting of the Native Americans in the show. In their journey from Georgia, they most likely have come across some, particularly at trading posts. 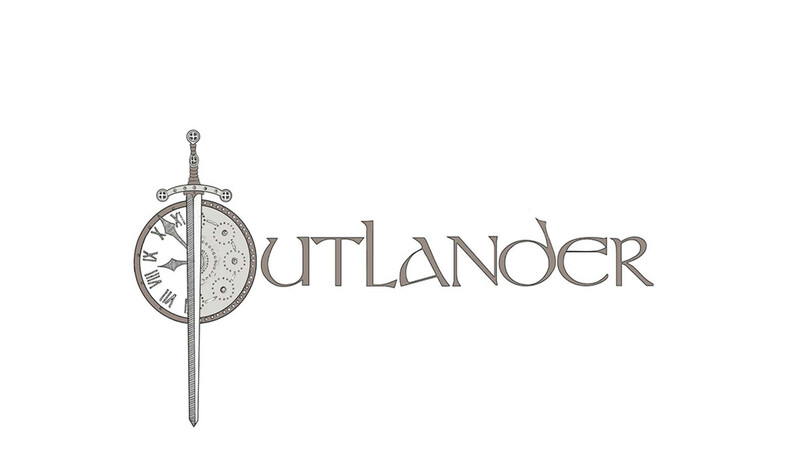 It’s interesting seeing the Cherokee at Fraser’s Ridge, with Jamie and Claire not sure if they are friendly. The encounter demonstrates how their challenge will be to make peace with their new neighbors. 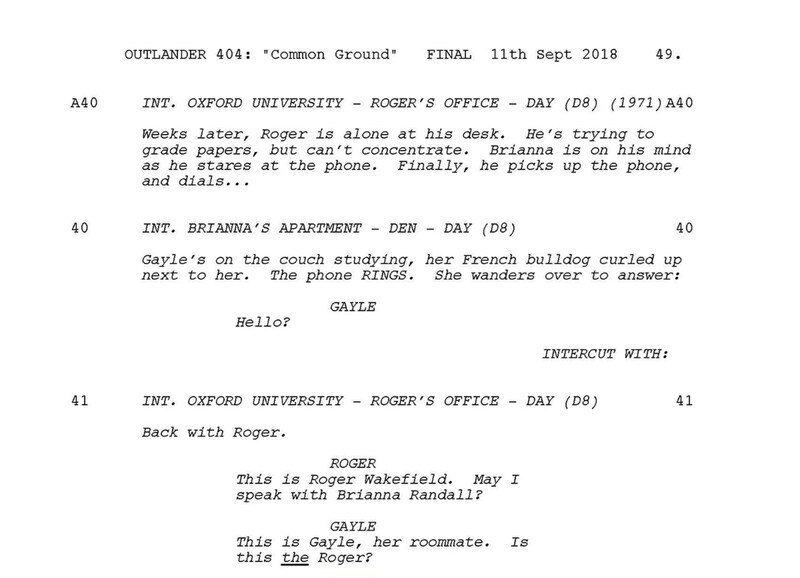 Now that Roger and Bree have broken up, we realized Roger had no one to talk to about his loneliness and melancholy over losing his love, so we invented the character of Peter, a colleague at Oxford, to illuminate Roger’s mood and show that he’s not his old self without Brianna in his life. 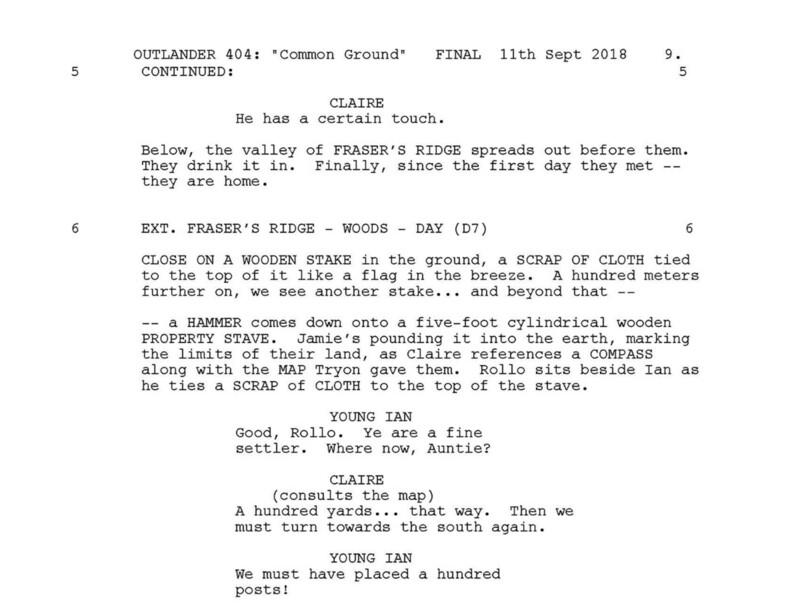 We intercut Claire and Jamie working on their land with a blurb that Roger finds in the book and used his voiceover to connect the history of the Grandfather Mountain area of North Carolina with what’s happening in the 18th century as Claire and Jamie build their new home. 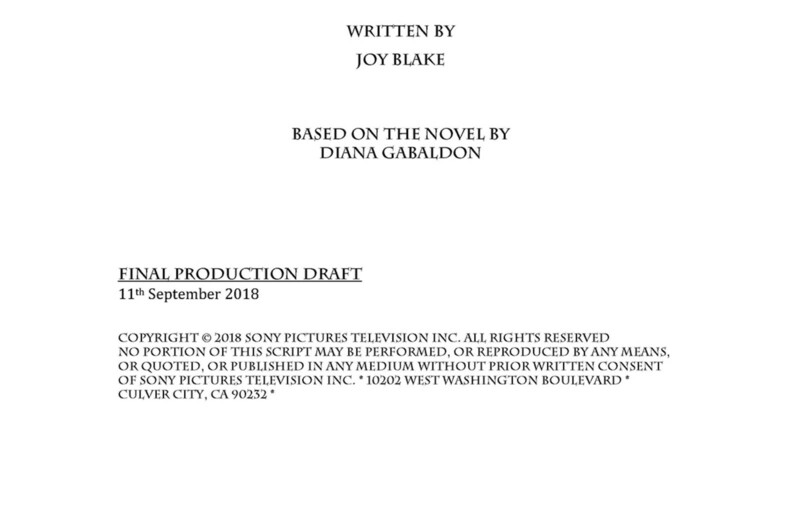 The author’s biography on the book cover is a nod to our STARZ executive Karen Bailey, who is from North Carolina and has always been a champion of Outlander (although the photo of the author here is not actually Karen Bailey). This is the calm before the storm. 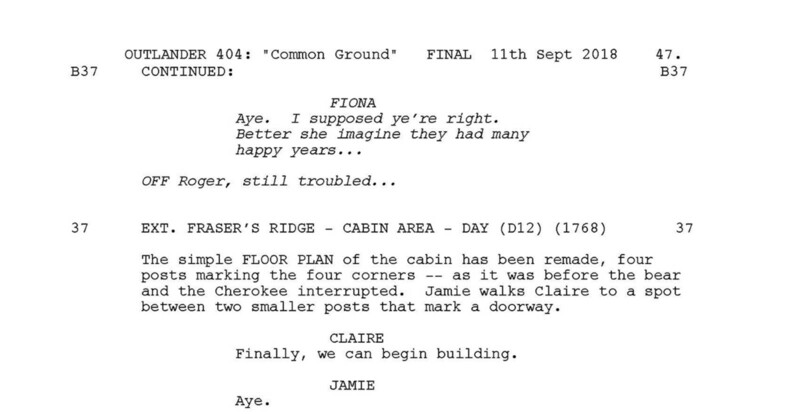 Jamie excitedly shows Claire the cabin that’s in the early stages of being built before things start to go south. Their excitement is soon dampened with another appearance by the Cherokee. We wanted to come up with something threatening as the Cherokees’ animosity towards them escalates. We see that the Cherokee have removed the boundary stakes and thrown them on the ground, expressing their displeasure at the new Scottish neighbors. Here we use Brianna’s roommate, Gayle, to show that Brianna is living in an apartment in Boston and attending MIT. 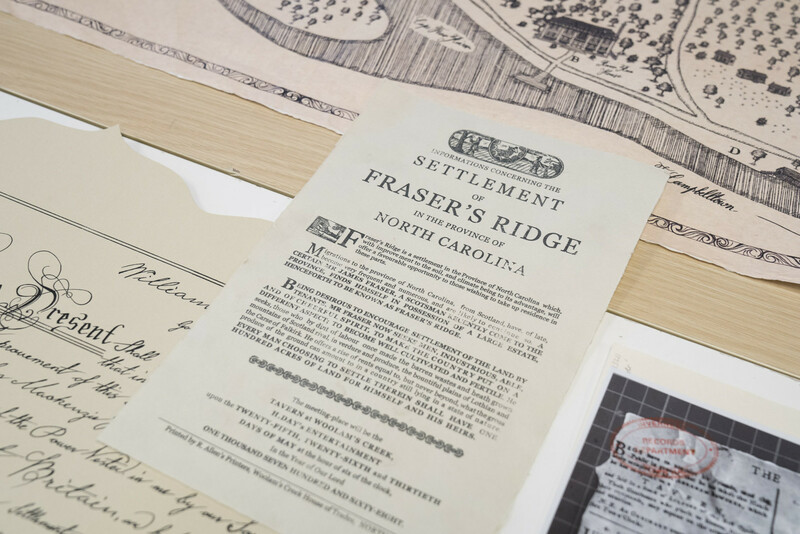 Roger tells Brianna of the evidence he found—Claire did find Jamie, and they lived on a large land tract in North Carolina. The serendipity is that they lived on the very same land where this young couple recently travelled on their trip to the Scottish Festival. But the phone call bittersweet as there are still unresolved feelings between Bree and Roger. 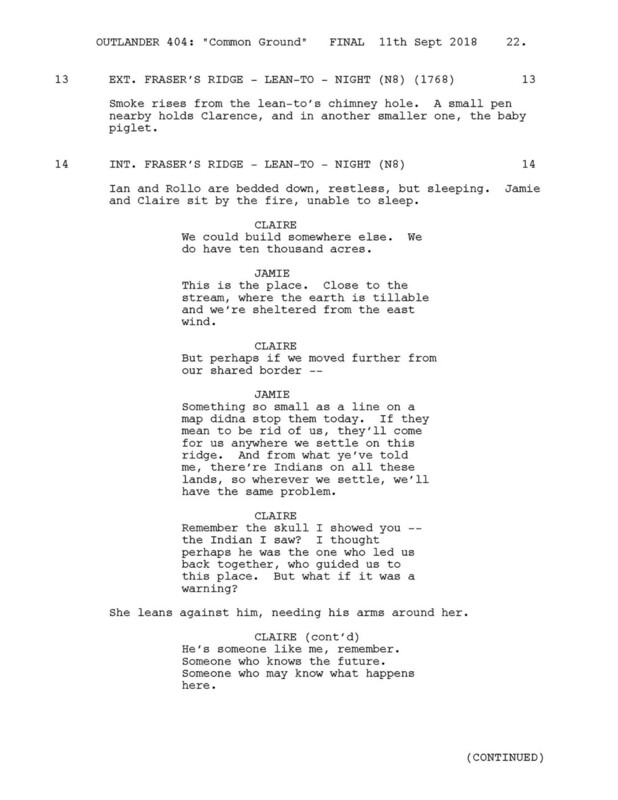 With Roger stating that he wanted Bree “all or not at all,” this scene was meant to demonstrate that both still have feelings for one another but are unable to connect because of their standoff at the Scottish Festival. Roger gives Brianna the gift of knowledge that her mother made it back to the past and lived happily, despite no longer being her boyfriend. Our executive producer Maril Davis has an amazing French Bulldog named Carrot, who is much beloved at our writers’ office and visits us often. We had been looking to give Carrot a cameo in the series and decided that she might make an excellent pet for Gayle. You will see Carrot’s debut here and again in scene 40. She’s a scene stealer! 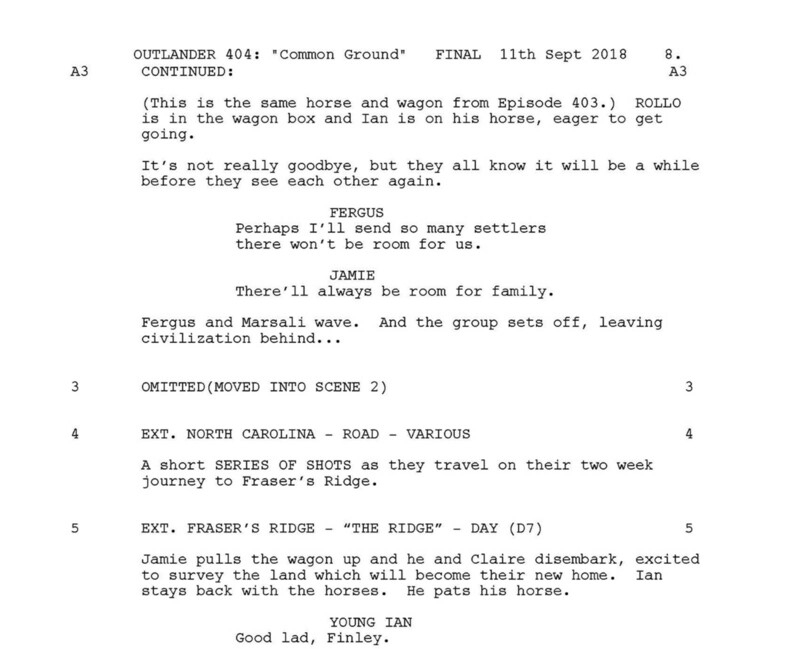 Rest assured, no horses were hurt in the filming of this scene! The wound was painted on. 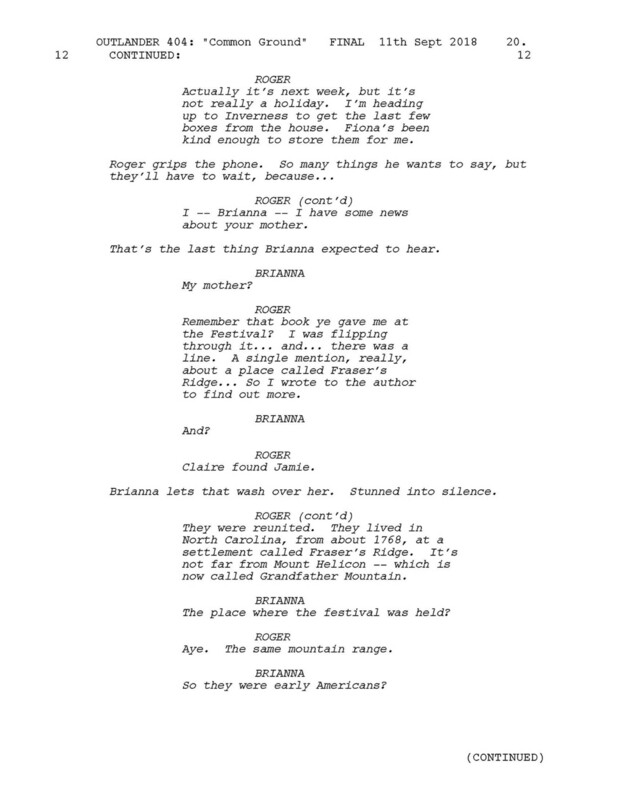 We wanted Claire to realize it wasn’t the Cherokee attacking their campsite—she recognizes the wounds on their horse as being that of a bear’s claw. 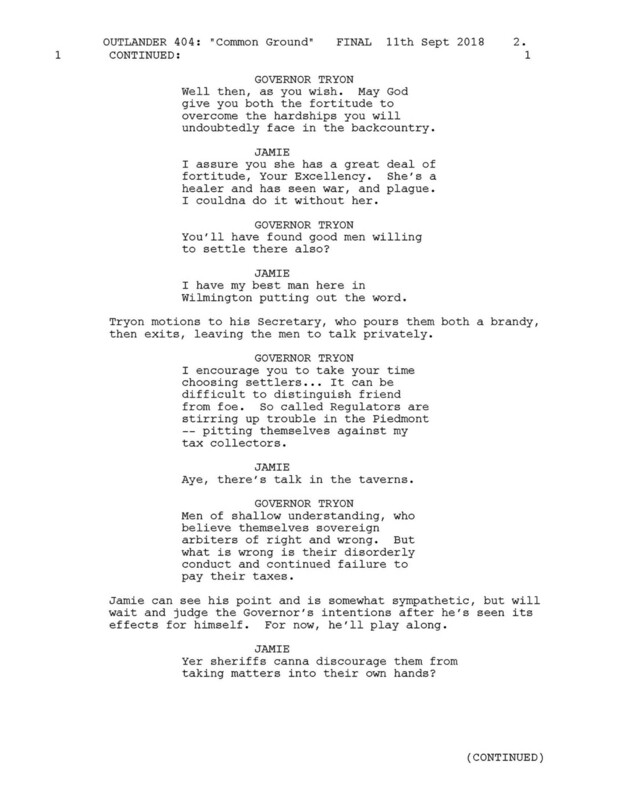 The character of John Quincy Myers was a great character in the book and a useful conduit, not only to teach Jamie a few Cherokee words, but also to shed some light that the Cherokee were having trouble with “Tskili Yona.” Myers explains that it means something akin to “evil bear spirit.” Jamie wants to visit the Cherokee village, but Myers talks Jamie into letting him go instead because he is more familiar with the Natives. Young Ian’s speech about knitting comes from the book, although from a different section. We thought it fit nicely in this scene, as they’re working with fishing nets. Diana mentioned to us that Young Ian’s line, “Everyone kens how to clickit,” was a fan favorite from the book, so we were sure to use it. 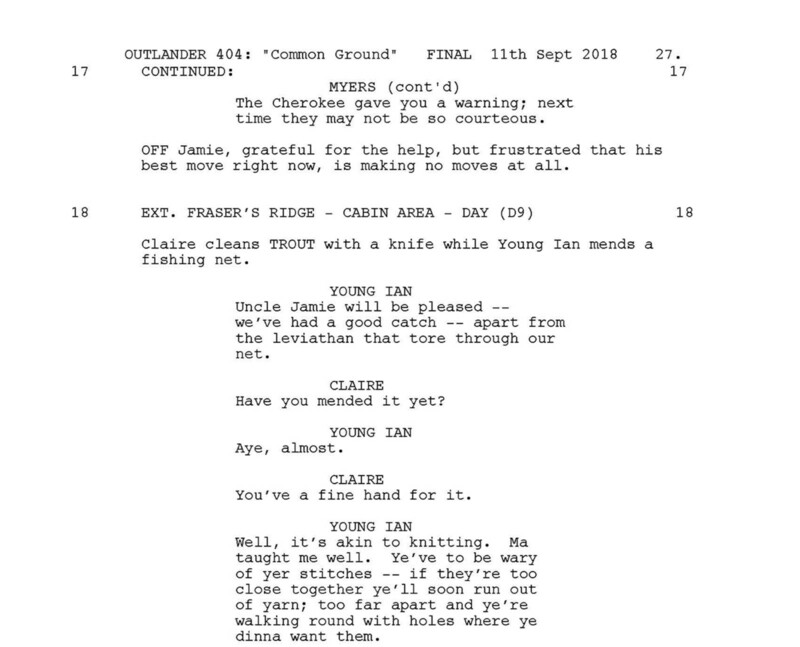 We like the role reversal here because in the 18th century, men know how to knit, but Claire ironically does not knit even though she knows how to stitch wounds. It was a particularly cold day in Scotland when this scene was filmed, and Caitriona had quite a time having to put her fingers inside a freezing-cold fish over and over while filming this this scene. 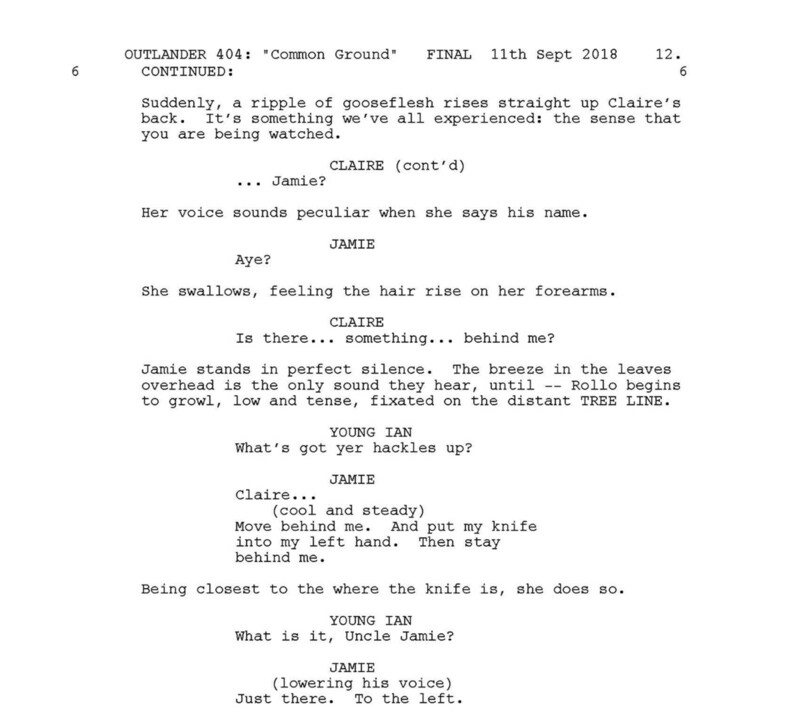 There’s another fan favorite moment here, where Jamie sneaks behind Claire, accidentally startling her, and she whirls around, hitting him in the face with a fish. 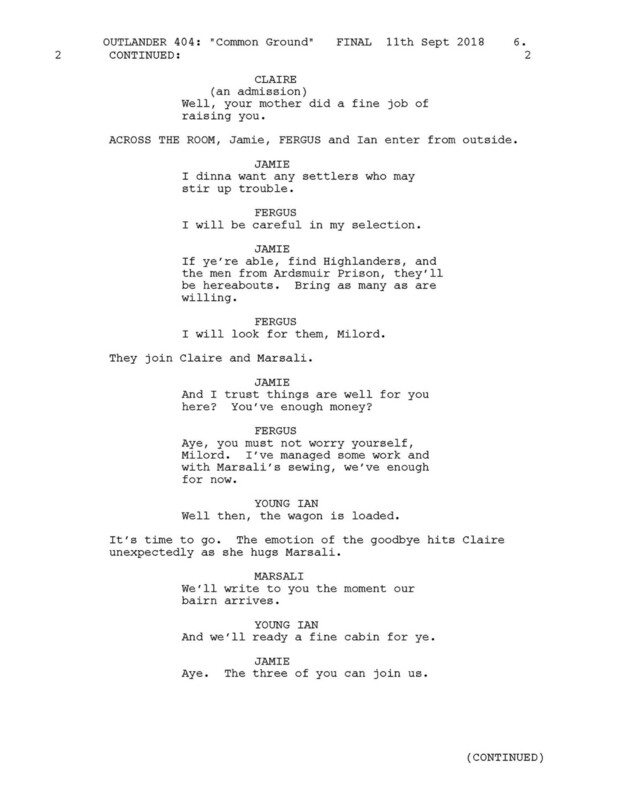 We loved this scene in the book and planned to portray this moment. Unfortunately, the location where we filmed made this impossible. Their camp in the woods was among some very slender trees, and one could see far in all directions. 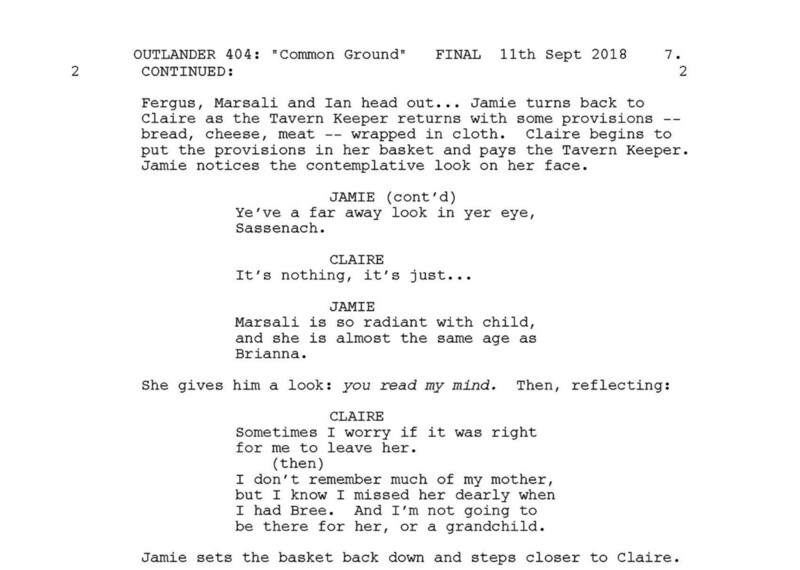 It wasn’t feasible for Jamie to walk up behind Claire without her realizing he was there, thus we had to sacrifice this moment. 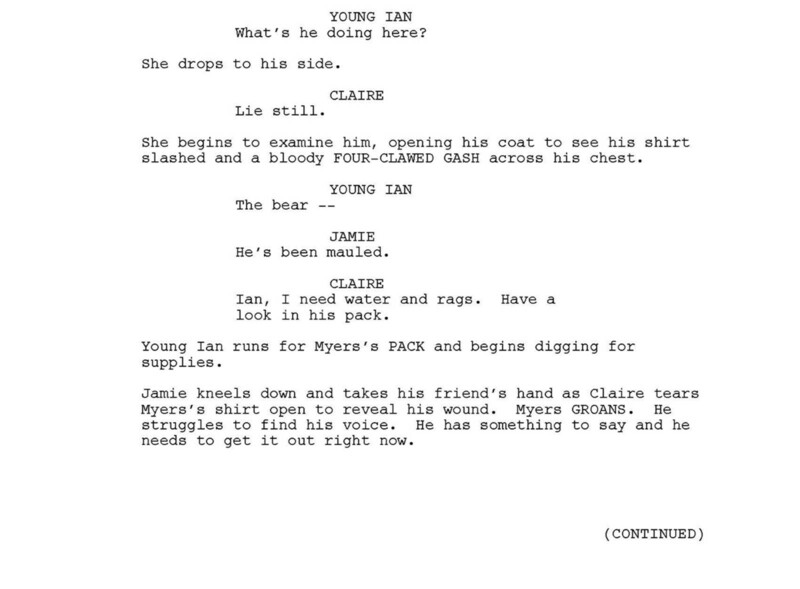 We replaced it with a scene with Claire practicing her shooting, since she knows there’s a dangerous bear in the area. 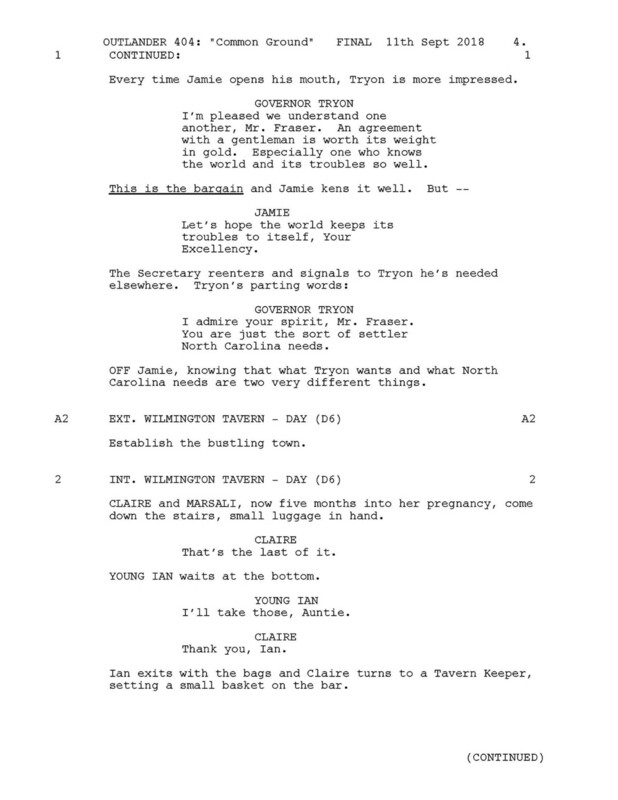 In the original draft, John Quincy Myers dies in this scene, but the writers and producers fell in love with the actor who portrays him, Kyle Rees. Kyle does such a wonderful job playing John Quincy that we decided to keep him alive so that he could be with us for more episodes. Nevertheless, we wanted to make this scene very tense and suspenseful, to demonstrate the seriousness and viciousness of this bear attack. 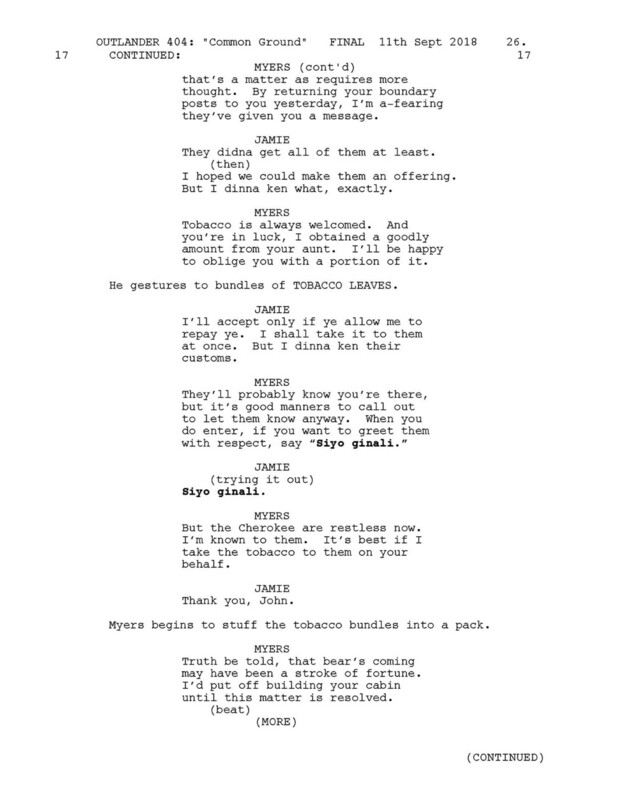 We had an idea early on to intercut the images of the Cherokee praying against the bear attack with Jamie hunting the bear in the woods. 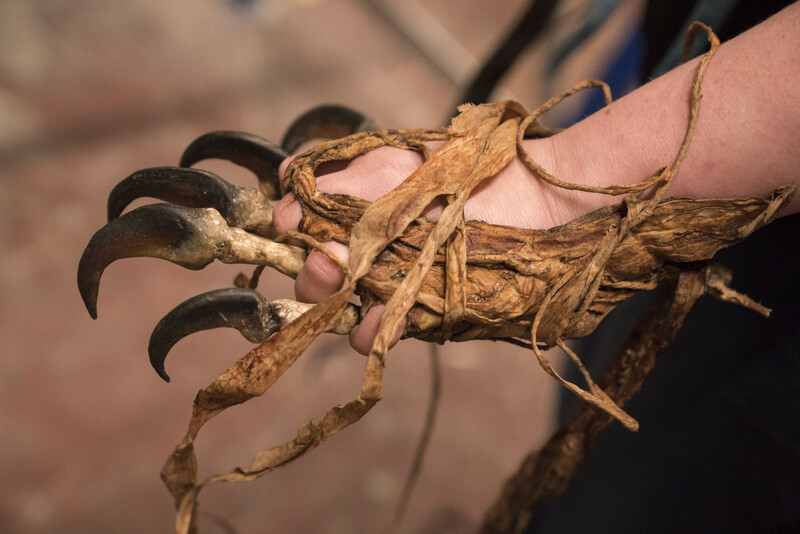 The Cherokee handled it in their own way, which was to fight the bear on a spiritual level. It makes for a cool juxtaposition. 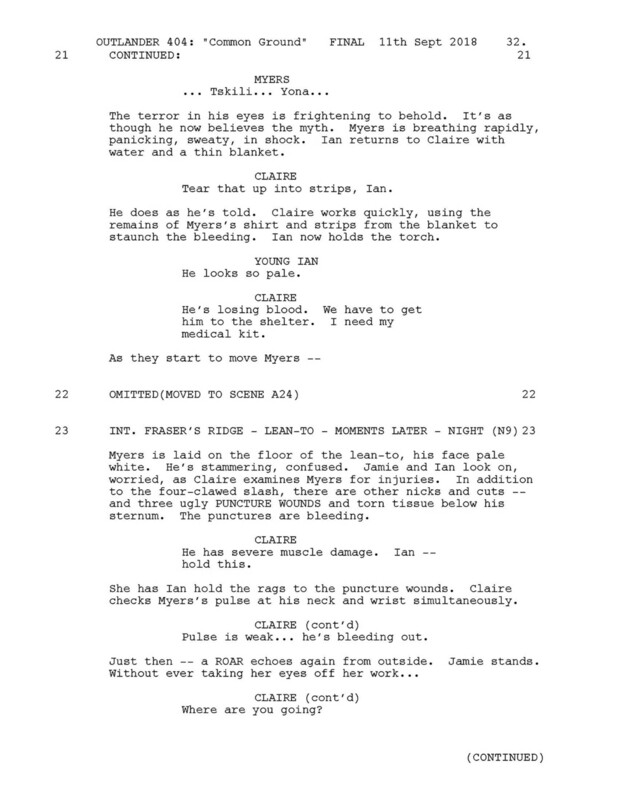 This scene was constructed so that Claire would discover, through the human bite marks found during her medical examination of John Quincy Myers, that this wasn’t a bear but a human being! 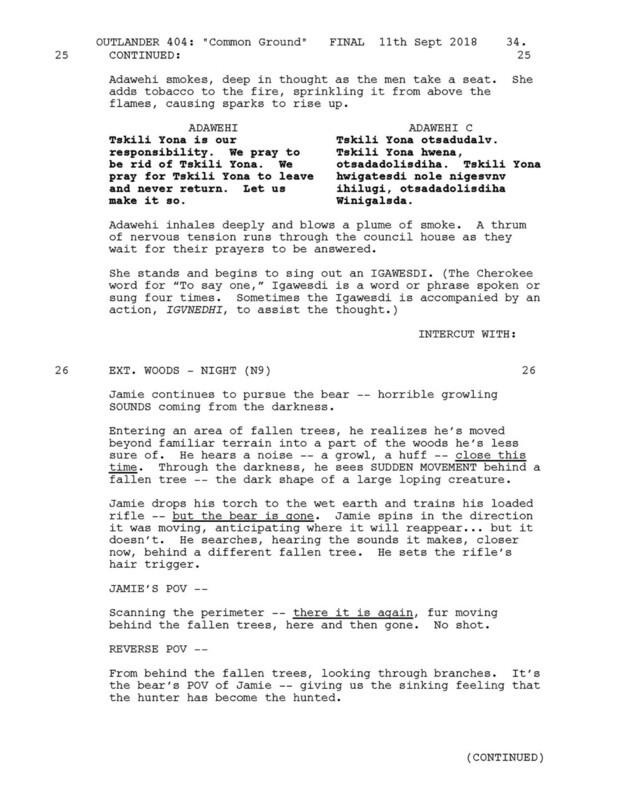 In editing, parts of this sequence were re-ordered to maximize the suspense of the scene. 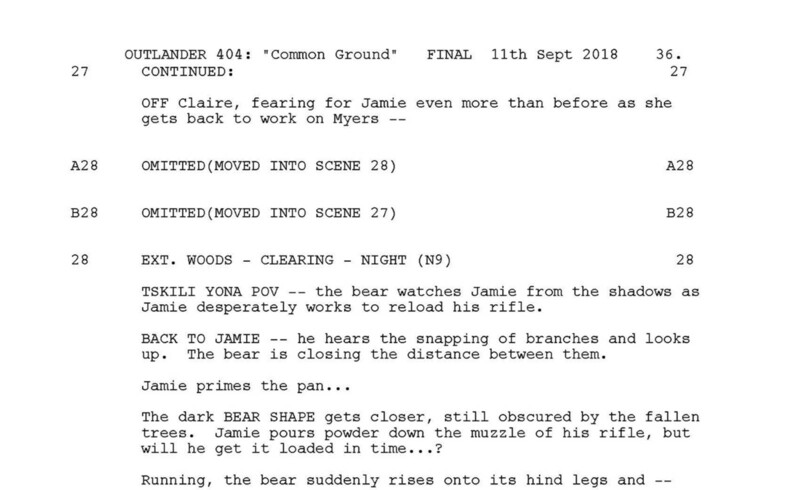 We knew that Jamie’s fight with the bear was a fan favorite in the book, but we also knew our scene would inevitably draw comparisons to Leonardo DiCaprio’s now legendary bear fight in The Revenant, something we were hesitant to do. 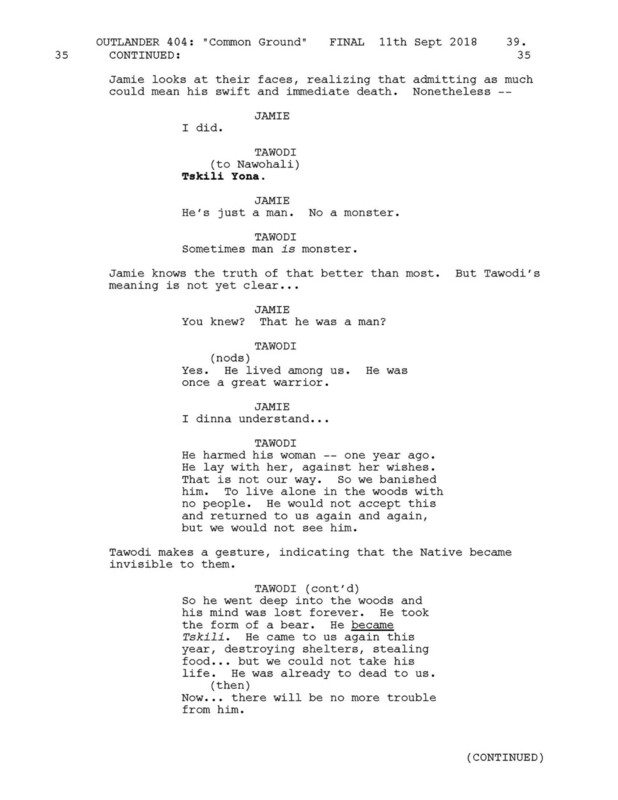 The scene in that film was rehearsed for months and done digitally with expensive special effects. As we joked about using a man in a bear suit, a unique idea evolved—what if it was literally a man in a bear suit? Matthew B. Roberts had travelled in North Carolina on a research trip and spent time with the Cherokee. He talked with them about the possibility of using a Cherokee dressed as a bear and how that might come about. 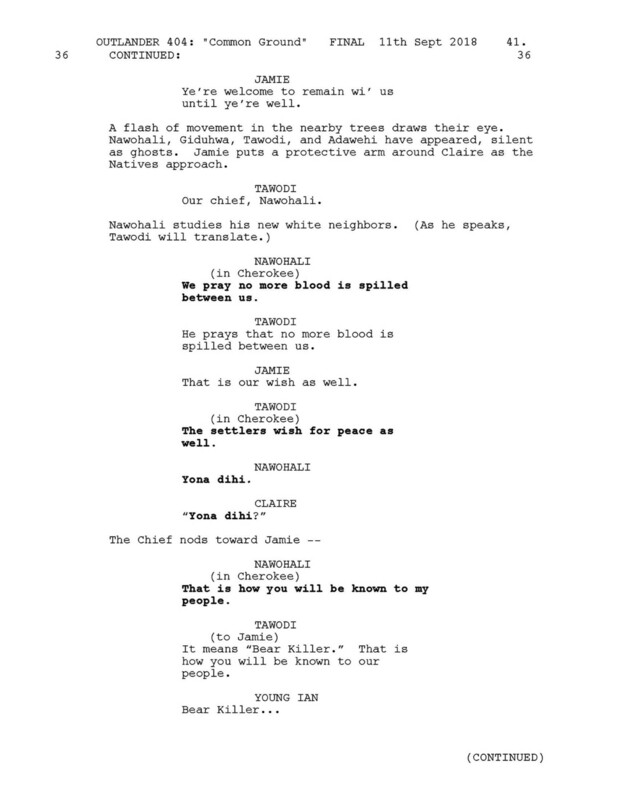 We then constructed a story where by a former warrior had committed a crime and been banished by the tribe—something that the Cherokee actually do to punish a brother who can no longer live among them. 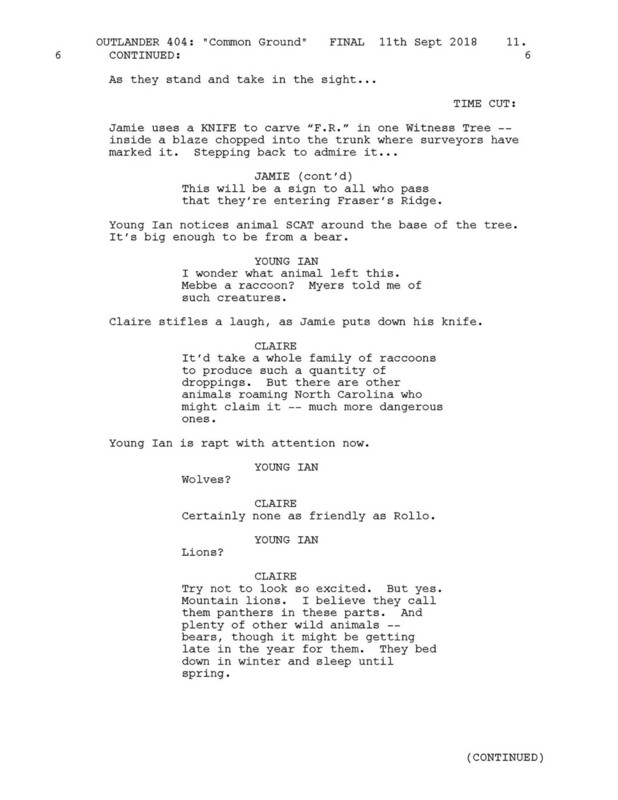 Forced to live alone in the woods and without community, this character goes into a mental decline where he takes on a persona of a bear, threatening both his former tribe and also nearby settlers. We liked the dark psychology behind this and thought it would be an interesting way to portray this story and a great reveal for the audience. 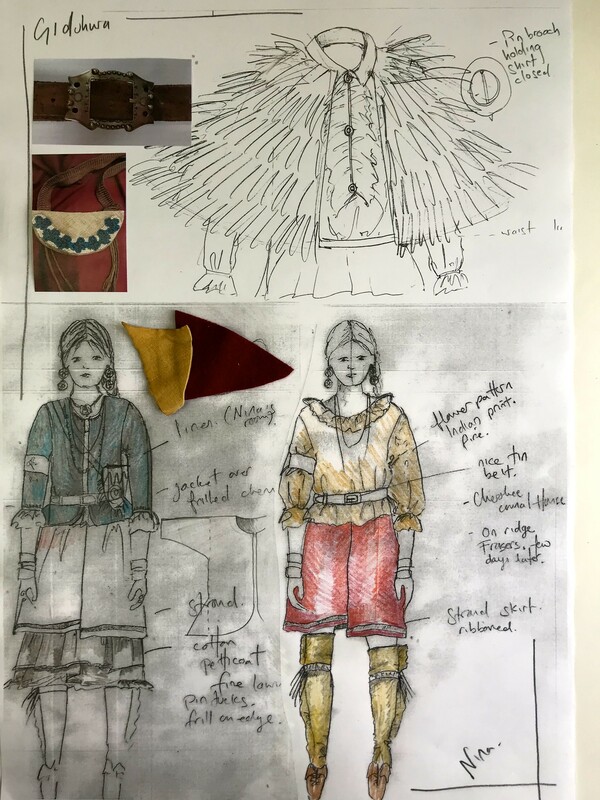 Shout out to Terry Dresbach who designed the bear wardrobe for Tskili Yona! Terry was very excited when we first pitched the idea for this story, and how we wanted a bear costume for a man. She researched it and sent us many pictures of how the Native Americans used animal fur and even the heads of certain animals in their dress, which got us even more excited about the story. 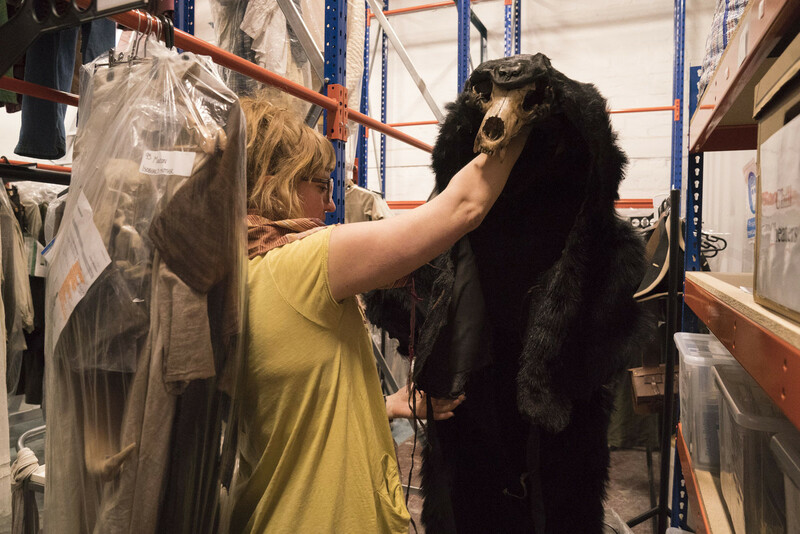 Terry had a strong vision for the character and designed her own version of the bear suit for the Tskili Yona. It was truly terrifying. 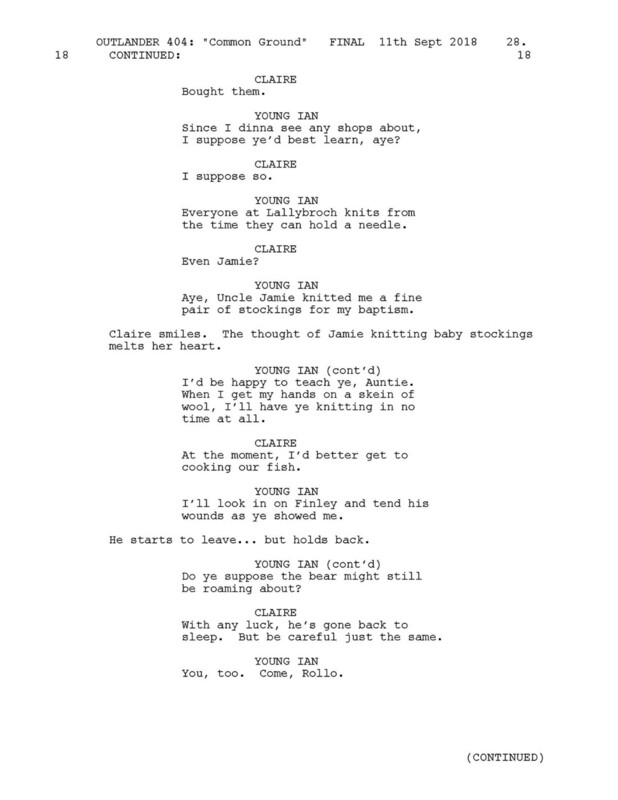 It allowed us to tell the tale of Jamie’s bear fight but with our own spin on it. 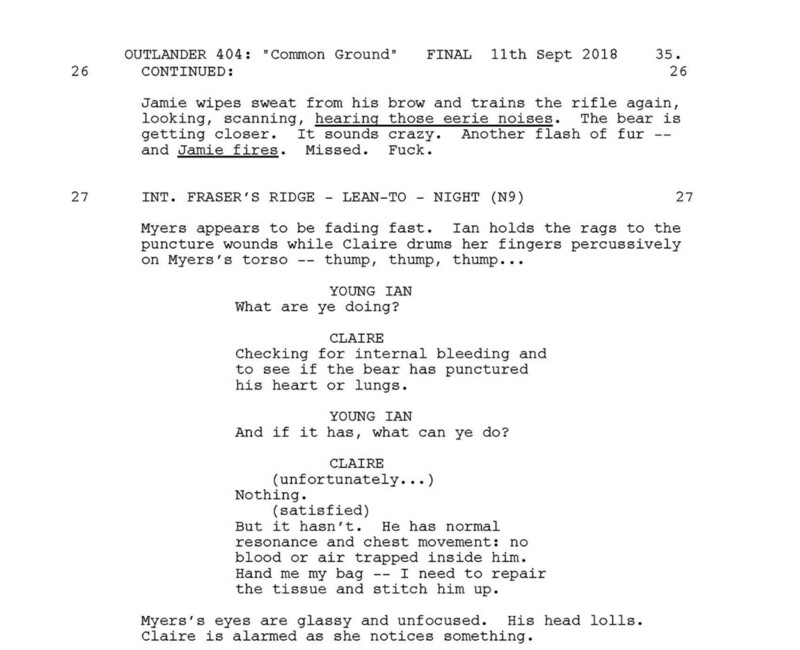 Although Jamie starts out with his rifle, we wanted it to ultimately come down to hand-to-hand combat with the bear/man, so that Jamie must use his own strength and wit to kill the bear. He needed to come up with a creative solution. Because Jamie was near the witness tree where he marked the boundaries of his land, we thought it was cool that he use one of the stakes to drive it through the bear/man and finally win the fight. 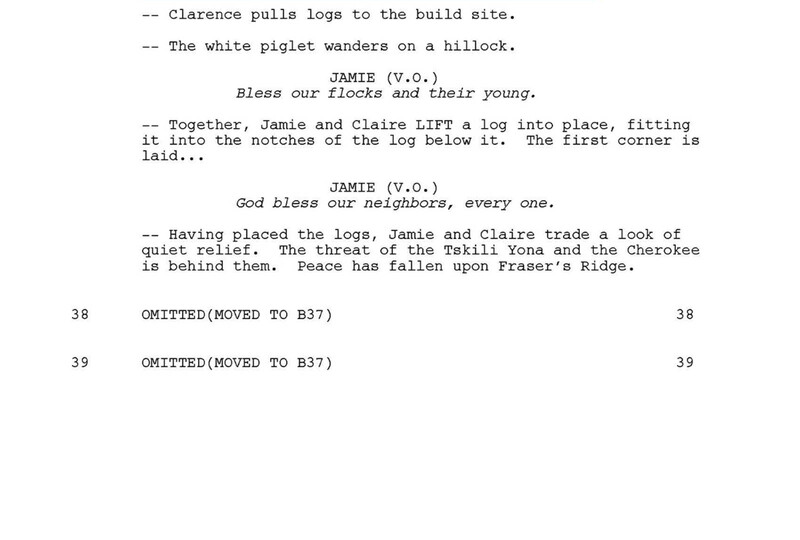 Jamie uses the greeting John Quincy Myers taught him to go into the village and bring the bear/man. We worked with our Cherokee consultant to portray the backstory of the bear/ man and how he came to be separated from his tribe. It was interesting to learn that they often choose to punish someone who had done wrong by banishing them from the tribe—making him invisible—something that the former warrior couldn’t handle, and thus he took on the persona of a bear, ultimately retaliating and becoming a threat to the tribe and the nearby settlers. Last week, we witnessed Roger see Fiona and Ernie move things into his childhood home. We thought it would be poignant for Roger to see the changes Fiona is making, as it would naturally make Roger feel nostalgic, even though he’s happy for Fiona. Richard Rankin also does a tremendous job of portraying two feelings at once and the ambivalence his character often feels at certain moments. 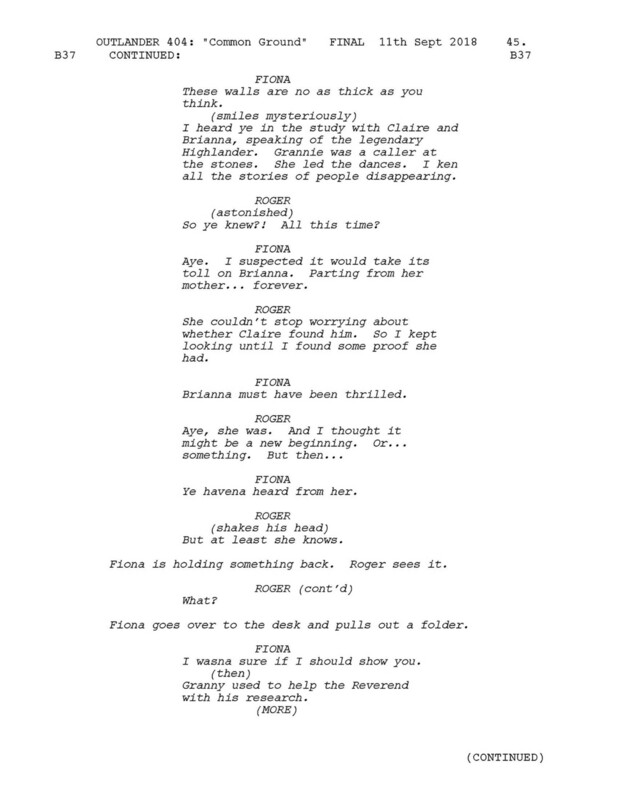 The shocking thing in this scene is learning that Fiona has known about time travel all along! We debated whether Fiona should be in on the secret, but it was natural that Mrs. Graham, her grandmother, was a caller and thus Fiona would hear stories of people disappearing through the stones. 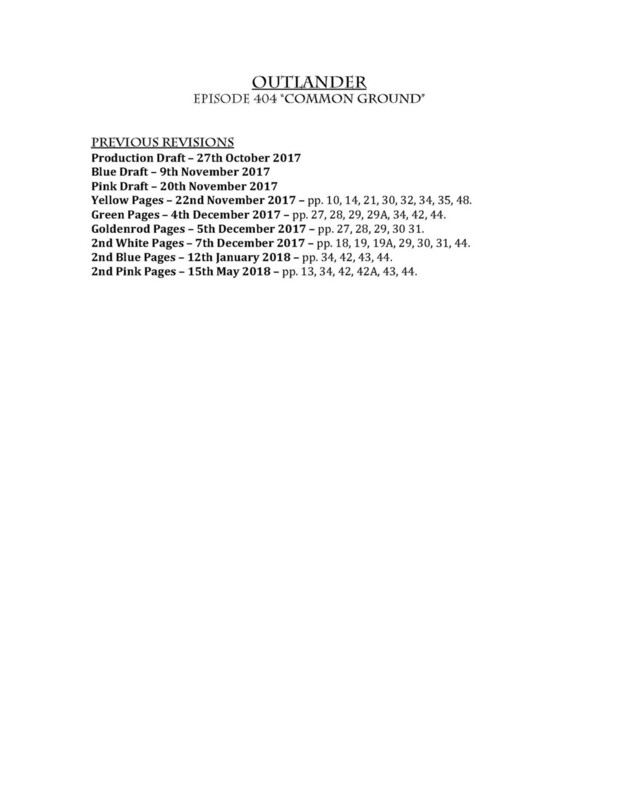 We chose to play in last year’s episode 304, that Fiona was around when Roger, Claire, and Bree were researching Jamie’s whereabouts in the 18th century. We thought it would be fun to reveal—to Roger’s shock—that she’s known their secret from the beginning. 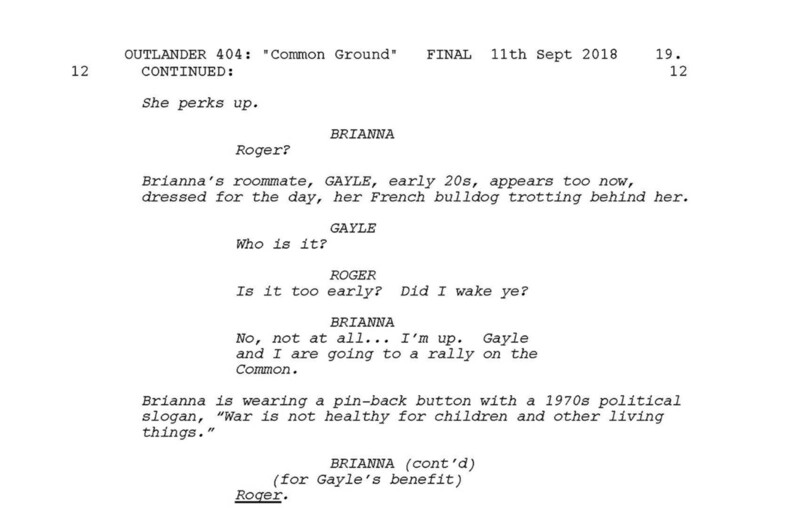 There was a lot of discussion in the writers’ room about when and how Roger would find information about Brianna’s parents and when to reveal it to her. 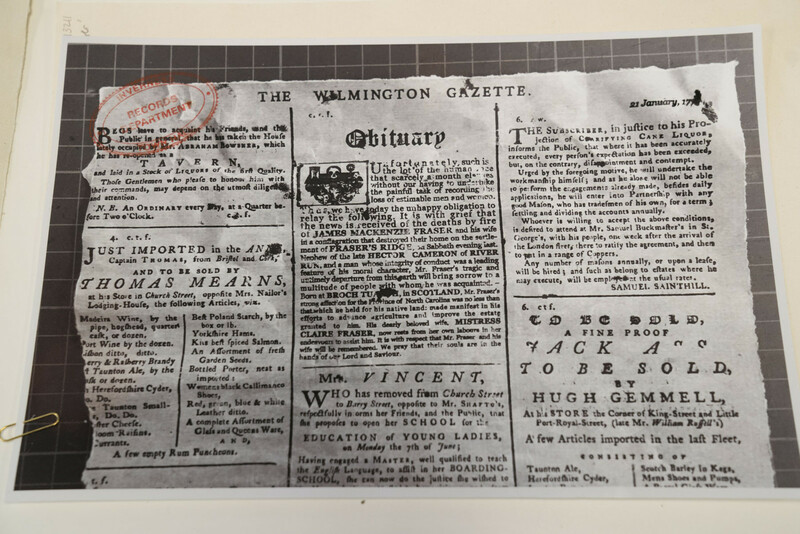 At one point, we wanted Roger to find out everything at once, but we realized that it would be hard to have him call and tell her the good news, yet withhold the bad news, so we came up with a way for him to find out about the obituary after he has given her good news. This way, he knew how happy she was at the news her mom was alive and with Jamie and would be reluctant to call back and tell her the about the fire. It was important to show Roger struggle with how much information he should relay, but in the end, he decides not to, in what he considers an act of kindness, as this knowledge would surely break Brianna’s heart. 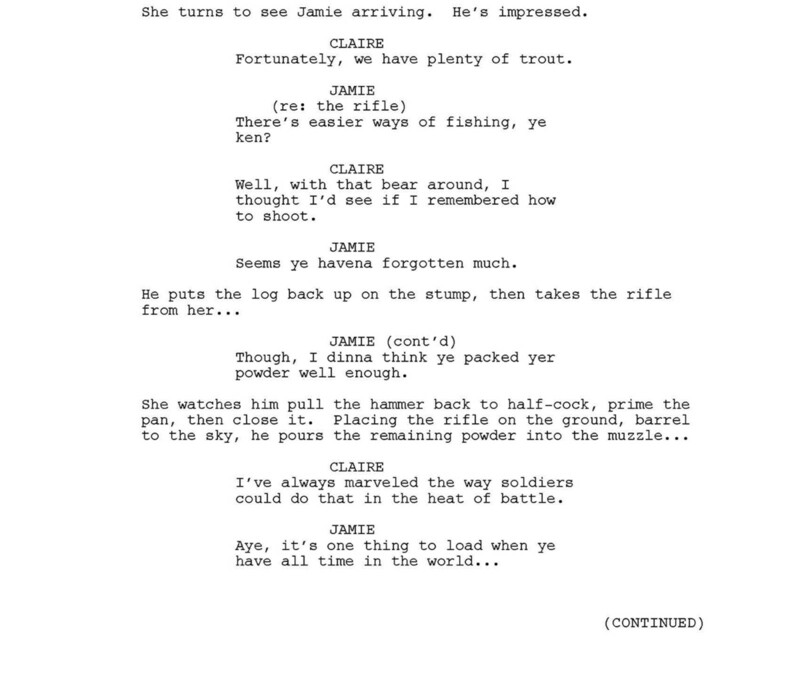 This is a fun, romantic bit where Jamie gives Claire a tour of what will soon be their home. 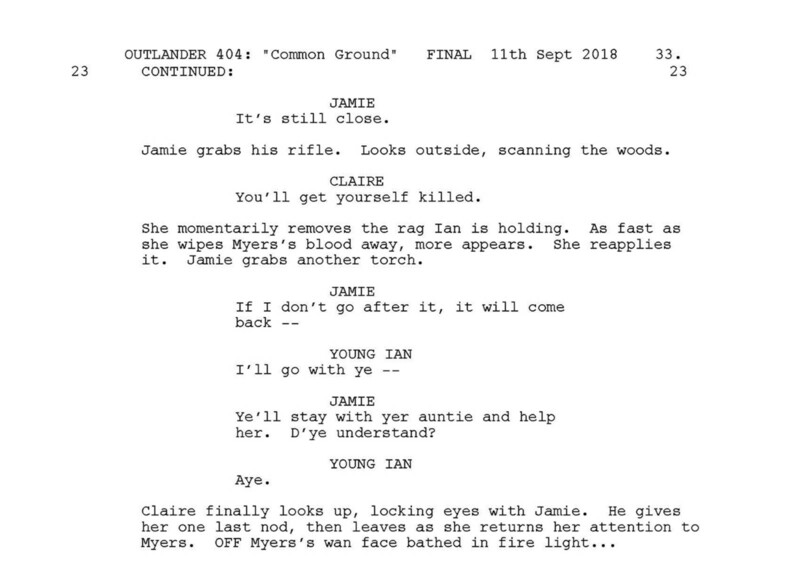 This is a scene showing Claire, Jamie, and Ian working together. 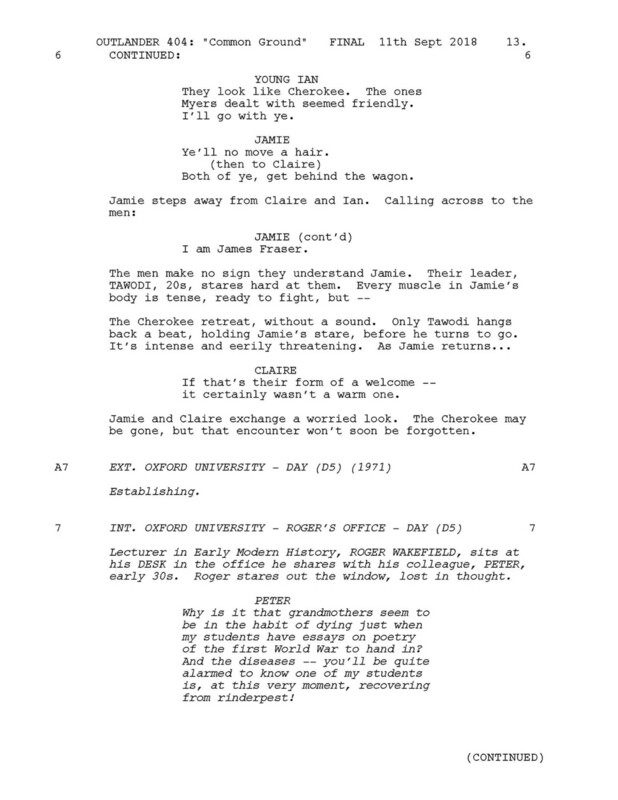 You may notice that sometimes the action in the script doesn’t match exactly what ends up on the screen. 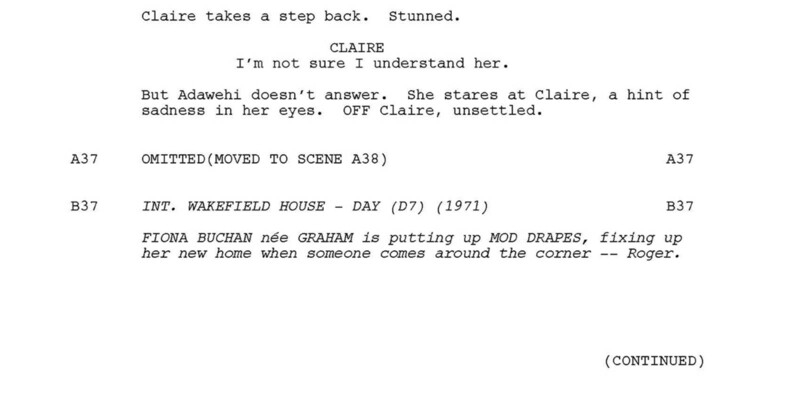 That is because often the writers will describe such a scene as placeholders. They might be suggestions for shots, but often in production, the director, set designer, or supervising writer on set might come up with other ideas, or the location may demand something slightly different from what we’ve written. 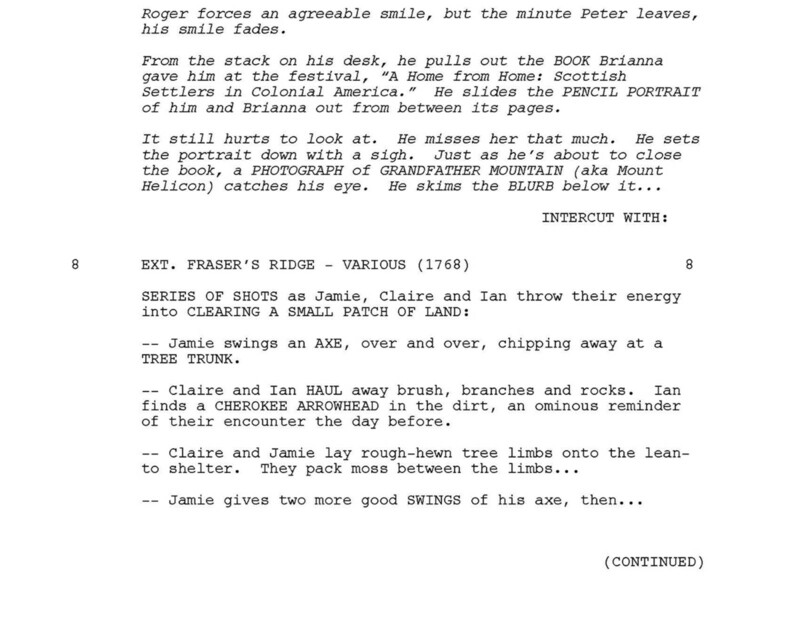 Roger, still troubled by the knowledge of the fire at Fraser’s Ridge, calls Brianna. Perhaps to tell her the news about the fire, since it’s something he’s been wrestling with since he found the obituary. However, he doesn’t get the chance, as we learn Brianna’s already left. 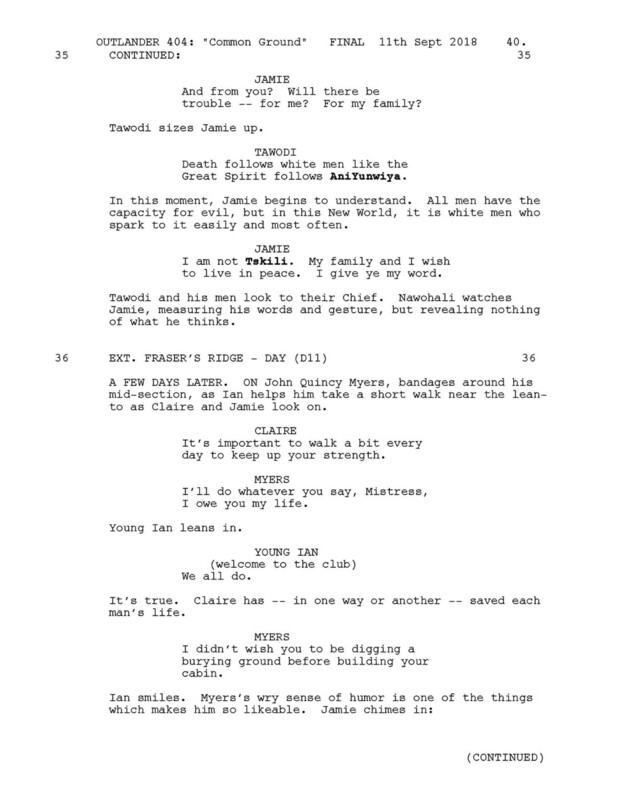 The words “to visit her mother” are important here because it alerts Roger to the fact that Brianna likely travelled back through the stones—something that alarms him greatly. 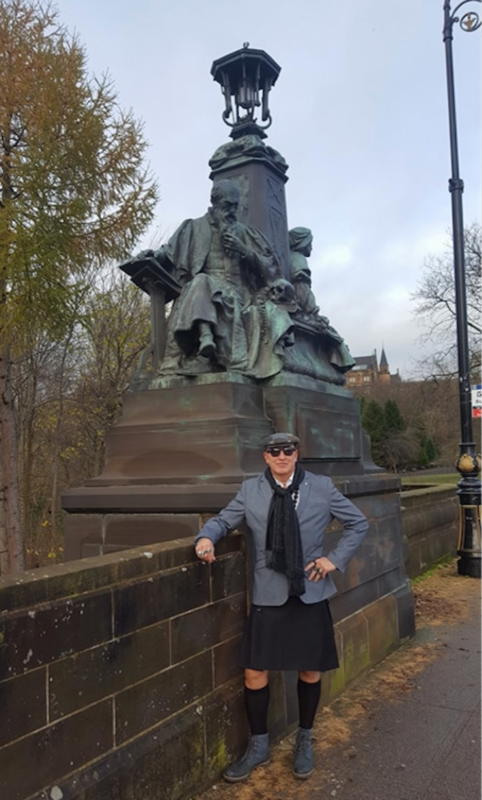 Flint Eagle spoke of the choreographed fight with Sam Heughan: “I have worked as a stunt man and actor for over thirty years and never before have I fought someone with the fitness of Sam Heughan, he is a phenomenon.” Flint Eagle enjoyed his time in Scotland so much that he purchased a kilt of his very own.